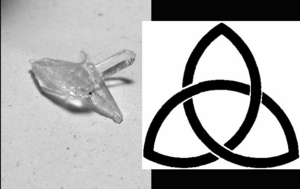 A Triquetra or Celtic Trinity is an ancient symbol from the late Christian period of the Holy Trinity: Father, Son, Holy Ghost - and it was as if a light of recognition came on when we first saw this amazing quartz quantum cluster. Four doubly-terminated crystals interlock to form this symbol; quantum clusters are alleged to have the power to help you ride the next wave to your future as you clarify and speak your intent. 3/16x 1/2x 3/4". Rainbows show through from drusy across the cluster's base. No damage seen under 15x loupe. Would make an incredible, powerful pendant.